In The Bespin Gambit, you’ll find a wealth of new content to take your campaigns and skirmishes into the ritzy hotels and industrial underworks of Cloud City. Iconic characters like Bossk and Lando Calrissian join the game for the first time, gorgeous new map tiles portray some of the most memorable Cloud City locations, while new companions and a new condition change the flow every game. 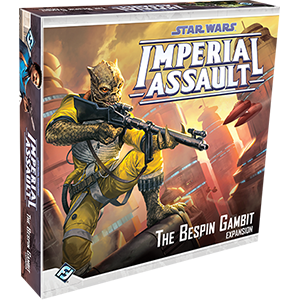 With two new Rebel heroes, one new Imperial class, new Mercenaries figure groups, a new mini-campaign, and a new focus on your Spy characters, The Bespin Gambit offers an indispensable bonus to every Imperial Assault player.